CHAMPION No. 3 docked at the wharf at Mason, West Virginia, with Pomeroy in the background, taken in 1910. A streetcar, as well as the Pomeroy passenger depot visible in the background. Racine-Graham Station ferry LYDIA CROSS. Str. TELEGRAPH heading upriver to Syracuse to load with salt. Pomeroy’s CHAMPION No. 2 in the foreground. This photo shows Str. DELTA QUEEN downbound towards Pomeroy. This National Historic Landmark will return to cruising America’s inland waterways in 2020. “Here’s to you all, our sentiments are real, may your days be as bright and your hearts be as light as the spray from an ol’ paddlewheel.” — Unknown. Something amazing happened earlier this week: it was announced DELTA QUEEN will once again sail on America’s inland waterways in 2020, after a 12 year absence. 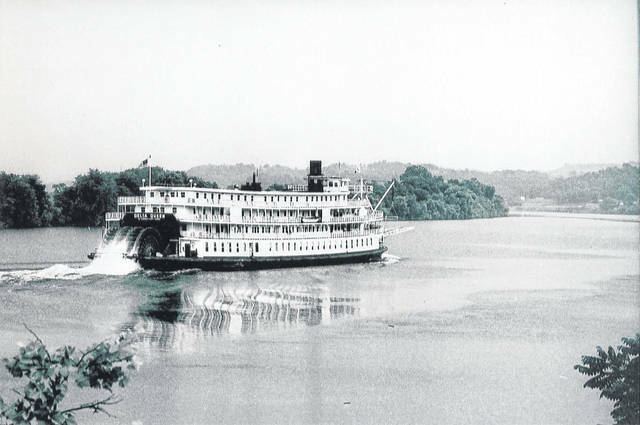 This is exciting news for steamboat lovers and has given me the inspiration to share some history on some of Meigs County’s most famous steamboats, as well as to shed some light on the beloved DELTA QUEEN. Full steam ahead! 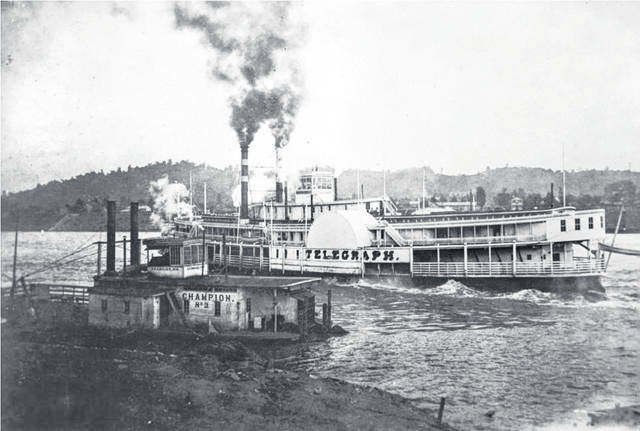 Another famous steamboat which held a longtime speed record was a sidewheeler called TELEGRAPH. 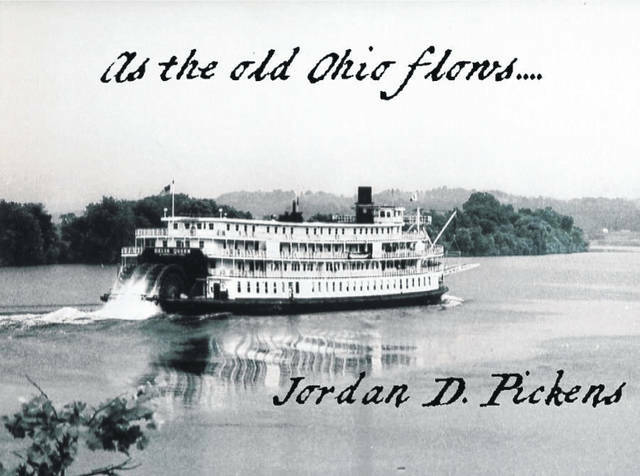 Before the construction of bridges, ferries were used to cross the Ohio River. 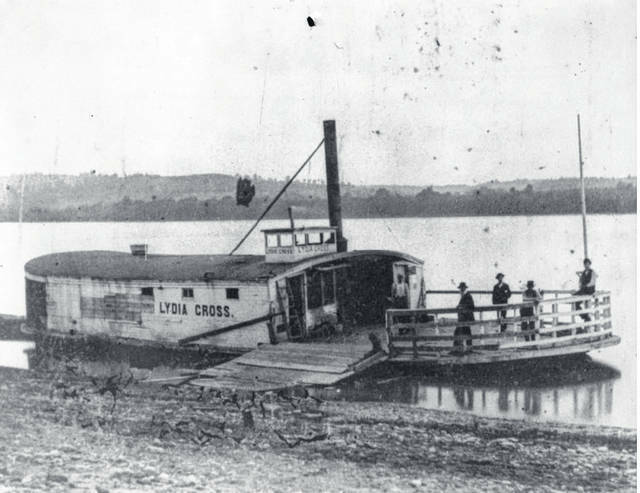 The first ferry in Meigs County appeared in 1854 and ran between Pomeroy, Ohio, and Mason, Virginia, now West Virginia. The name of the ferry was unknown, but it was noted that it was powered by horse. Middleport and West Columbia also received a ferry that year named LARK, powered by steam. Pomeroy’s first steam powered ferry KATE HOWARD went into service in 1857. LITTLE BEN, named after Ben Redmond of Middleport, Ohio, ran Middleport, Ohio, to Clifton, West Virginia. On April 14, 1913, she sank at the wharf grade at Middleport; she was pumped out by the towboat VALIANT. She was later owned by H.C. (Clate) Pickens and ran Racine, Ohio, to Graham Station, West Virginia. Another of Racine’s ferryboats was LYDIA CROSS. Little is known about this boat, other than it went into operation around 1876 and transported between Racine, Ohio, and Graham Station, West Virginia. 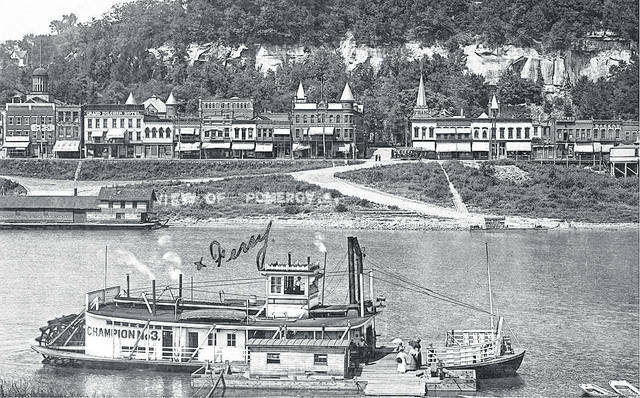 After KATE HOWARD went out of service, residents of Pomeroy, Ohio, and Mason, West Virginia, were ferried back and forth across the river by three different ferryboats, each named CHAMPION. CHAMPION served until 1882, when it was replaced by CHAMPION NO. 2. This vessel served for a 20-year period in Pomeroy, and in 1902 she was sold and operated at Gallipolis for a time. She was sold again in October 1904. In 1910 she was completely rebuilt at the Gardner Docks at Pt. Pleasant, West Virginia, and renamed RELIEF. Finally and arguably the most well known steamboat to pass Meigs County would be none other than that of DELTA QUEEN. Fabricated at Glasgow, Scotland along with her sister ship, the DELTA KING. All steel work was done on the River Clyde at the Isherwood Yard, Glasgow. Both boats were knocked down and the sections sent by steamship to San Francisco and then barged to Stockton where the boats were completed. The building operations extended from 1924 through part of 1927. Her machinery was built at Denny’s Shop in Dumbarton; the paddlewheel shafts and cranks were forged at the Krupp Works, Germany. The upper cabins were built by U.S. shipwrights, four decks high, largely of oak, teak, mahogany, and Oregon cedar. When completed the two boats were the most expensive river sternwheelers [existing], costing $875,000 each. In the beginning of her career she ran in the San Francisco-Sacramento trade on a regular year-round schedule. Frequent excursions were made to Stockton. She frequently carried 800 tons of freight. The staterooms slept 200. Rooms and passenger areas were air-conditioned, hot air heat. The cabins were finished in solid oak with natural mahogany and walnut trim. Plate glass windows surmounted by colored, leaded, stained glass transoms surrounded copious forward lounging areas. Seven watertight compartments divided the hulls [and]all hull space [was] usable. The kitchen was in the hold, pantries and dining room on the boiler deck, with dumbwaiters to convey food and utensils. The main deck was built entirely of ironwood from Thailand. Many rooms had connecting shower or bath, white tiled, and twin beds. All hardware was solid brass. The DELTA QUEEN and her sister ship were dedicated at the Banner Island shipyard, Stockton, on Friday, May 20, 1927 and entered service about June 1. They did handsomely, weathered the Great Depression, but a modern highway linking San Francisco and Sacramento was too much. The DELTA QUEEN’s last trip came on the closing day of the Golden Gate International Exposition, Sunday, September 29, 1940. Both boats were sold. After Pearl Harbor on December 7, 1941, the Navy took both boats and used them in the San Francisco Bay area, painted drab gray, designated “Yard Ferry Boats”. At war’s conclusion, they were turned over to the U.S. Maritime Commission. The DELTA QUEEN was sold at public sale to Greene Line Steamers. She was then transferred to New Orleans, first undergoing repairs and a complete renovation. Changes were extensive. Her two cabin decks were extended forward, dining room placed on the main deck which was formerly the freight area. The air-conditioning was completely renovated; paddlewheel covering was removed; fuel capacity augmented; many new luxury cabins added where the dining room had originally been; new pantries, bar and toilet facilities appended to numerous staterooms. The DELTA QUEEN left the Dravo Corporation yard at Neville Island, Pennsylvania on February 28, 1948 and arrived at Cincinnati March 1 to receive her new furniture, a swinging stage, etc. Since then she has been in tourist service on the Ohio, Mississippi, Tennessee and Cumberland rivers. Following the untimely death of Captain Tom R. Greene on July 10, 1950, the DELTA QUEEN was managed by his widow, Letha Cavendish Greene until advertised for sale. Richard C. Simonton reorganized Greene Line Steamers in 1950 and the DELTA QUEEN became a profitable venture. After Simonton became ill, on November 21, 1969, Greene Line was transferred to Overseas National Airways with operations based at Kennedy International Airport. The DELTA QUEEN ran head-on into Public Law 89-777 prohibiting the operation of wooden superstructure overnight passenger vessels. In 1971, President Richard M. Nixon exempted the DELTA QUEEN from the terms of the law for three years. [Subsequent presidential sanction has kept the boat operative until 2008, and on December 4, 2018 was re-exempted from sanctions and will return to cruising in 2020.] The DELTA QUEEN was brought 5,380 statute miles by sea, the lengthiest salt water transit of record for a flat-bottom sternwheeler. https://www.mydailyregister.com/wp-content/uploads/sites/24/2018/12/web1_12.6-Boat-1_ne20181251353779.jpgCHAMPION No. 3 docked at the wharf at Mason, West Virginia, with Pomeroy in the background, taken in 1910. A streetcar, as well as the Pomeroy passenger depot visible in the background. https://www.mydailyregister.com/wp-content/uploads/sites/24/2018/12/web1_12.6-Boat-2_ne201812513539115.jpgRacine-Graham Station ferry LYDIA CROSS. https://www.mydailyregister.com/wp-content/uploads/sites/24/2018/12/web1_12.6-Boat-3_ne2018125135310327.jpgStr. TELEGRAPH heading upriver to Syracuse to load with salt. Pomeroy’s CHAMPION No. 2 in the foreground. https://www.mydailyregister.com/wp-content/uploads/sites/24/2018/12/web1_12.6-Boat-4_ne2018125135311551.jpgThis photo shows Str. DELTA QUEEN downbound towards Pomeroy. This National Historic Landmark will return to cruising America’s inland waterways in 2020.